Bright & Clean LLC is a commercial cleaning company with locations in Kissimmee, FL and servicing Orlando, Celebration, St Cloud, Hunter’s Creek, Kissimmee and the surrounding areas. We know you require a professional janitorial service contractor to protect and maintain the appearance and integrity of your facility. Fully customizable, 24/7 cleaning service packages that suit your individual needs, your company needs and your budget. We handle all the items listed below to help enhance the professional appearance of your business and facilities. We handle everything on the move in / move out cleaning checklist. Vacuum and sweep all floors. Whether you are trying to maintain your home or business curb appeal, clean up an exterior surface, or increase property value we can help! We are experts at removing mold, mildew, algae, surface dirt and most other materials that will devalue and actually damage your property and sometimes your health. We want to be the pressure washing and surface cleaning contractor you choose for all of your pressure washing needs. Pressure washing is essential to maintaining any property. Dirt, mold and mildew is not just ugly to look at, it damages. 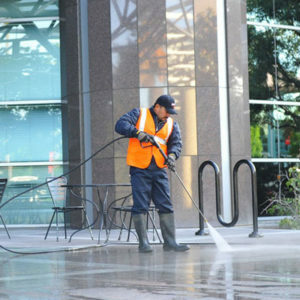 Pressure washing can pro-long the useful life of any property. Dirt, mold & mildew will cause rot, decay, premature failing of coatings and building materials. If your property needs cleaning, Bright and Clean, LLC is the company to do it. Our Pressure Washing Services includes the removal of mold, mildew grime, dust, mud, and dirt from Driveways, Decks, Roofs, Patios, Sidewalks, Lanai, Garage Floors, Fences, Homes of all kinds. We are a fully licensed and insured janitorial service company that is locally owned and that has been operating since 2003. We provide customized cleaning services to suit your individual or company needs and your budget. Whether you require daily, weekly or monthly service, or just one-time only service, you can count on us for top-notch cleaning at unbeatable rates. Contact us anytime for your FREE consultation. © Brightand Clean llc 2016-2019. All rights reserved.